SCENE OF THE CRIME: Anzacs in the Arab village of Surafend, southern Palestine, during World War I, from Terry Kinloch's Devils on Horses. In December 1918, Anzac soldiers murdered at least 40 villagers in reprisal for the killing of a Kiwi trooper. New light has been shed on a massacre at an Arab village by New Zealand and Australian troops in Palestine just after the end of World War I. The troops, armed with heavy sticks and bayonets, murdered between 40 and 120 men and then set fire to the village of Surafend on December 10, 1918. The atrocity, estimated to have involved up to 200 troops, was triggered by the death of Kiwi trooper Leslie Lowry, who was shot chasing a thief who stole the kitbag he was using as a pillow. 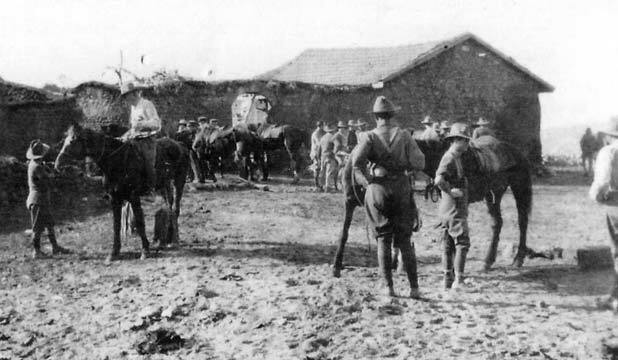 A new book, Beersheba, by Australian journalist Paul Daley, says there was evidence the legendary Australian Light Horse Regiment was closely involved. "It was always thought that New Zealanders were mainly responsible for the massacre," Daley said. "The Australians' participation was assumed but never really proven." Then, one day last year, while researching in the Australian War Memorial museum, Daley came across a tape recording of an old Light Horseman, Ted O'Brien, who described in graphic detail how he and his comrades had "had a good issue of rum" and "done their blocks" in Surafend, and how they "went through [the village] with a bayonet". The Bedouin inhabitants, he said, were "wicked ... You'd shoot them on sight". Of the massacre, he said: "It was [a] real bad thing ... It was ungodly." Daley said that, although "some people would no doubt define Surafend as a war crime, I haven't called it that. Technically, I don't think it was covered back then by the Geneva Conventions, and it happened in December 1918, two months after the war ended." But New Zealand military historian Terry Kinloch, who wrote about the incident in Devils on Horses, said he had no doubt it was murder. Trooper Lowry was killed in sandhills near the Anzac Mounted Division camp and his body was found about 80 metres from the village, Kinloch said. Although no-one saw what happened, the villagers were already under suspicion of digging up the graves of New Zealanders and of thieving in adjoining camps. This, plus a trail of footprints reportedly leading to Surafend, was good enough for the New Zealanders. They threw a cordon around the village while a court of inquiry was conducted but, as no action was taken, the men became increasingly angry and frustrated. Officers ordered the cordon to be removed but the troops were not happy and began planning a punitive raid. THE OLD men, women and children were to be taken out of harm's way, then the village was to be searched. Any men found were to receive a beating. The troops armed themselves with pick handles, bayonets and iron strips and encircled Surafend. "Within 30 minutes, Surafend and a nearby Bedouin camp were on fire and around 40 male inhabitants were dead or dying," Kinloch wrote. Several courts of inquiry were convened but the men closed ranks and denied any knowledge of the incident. No participants were identified. Their commander, Brigadier General Edward Chaytor, turned his anger on the Auckland and Wellington Regiment officers for failing to know about or stop the attack. "Surprisingly, the only punishment that he imposed was to stop leave for all officers," Kinloch wrote. "No one was ever tried or punished for what happened at Surafend: the perpetrators literally got away with murder." However, expeditionary force commander General Sir Edmund Allenby was furious when he heard what had happened. He ordered the Anzac Mounted Division to be paraded and reportedly berated them as "nothing but a lot of cowards and murderers". Kinloch said it was unclear whether Australians or New Zealanders were in charge, but New Zealanders were probably in the majority. The crime could not be explained away as an over-reaction by stressed combatants caught up in the heat of the battle. "The raid was carefully planned and ruthlessly carried out by men who knew the war was over and that the victims presented no threat to them. Reluctantly, I must conclude that the purpose of the raid was to kill as many Arab men as possible." Many of the Anzacs considered the Arabs to be cowardly murderers and thieves who could get away with anything, Kinloch said. The village was rebuilt by the British Army, which was later reimbursed by the governments of New Zealand, which paid 858, and Australia, which paid 515. Daley said Surafend "highlights war's moral complexity and how otherwise good men can do terrible things. The Anzacs were not the mono-dimensional heroes they have been made out to be, and they themselves would never have seen themselves like that."